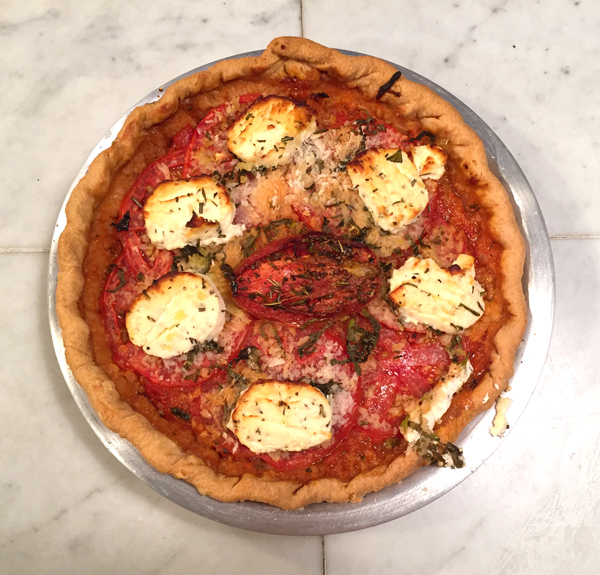 Looking for a recipe for a Southern Tomato Pie? You'll most likely find that most of the recipes are full of mayo and cheese. With this in mind, Chef Erickson invented this recipe that's a cross between a Provencal-style tomato tart and a classic deep dish tomato pie. It's healthy, delicious, and colorful! Enjoy it all summer long when tomatoes are at their best. Summer parties (especially backyard BBQ's and pool parties) are always fun to cater, especially when the hostess is vivacious and has lots of great ideas about what she wants to serve and how she wants to style it! Last Saturday's celebration at Joan and Stuart's Woodstock home was just this sort of affair with many good friends, family and lots of grandkids running around. No one let the unexpected rain dampen their spirits even though the whole party was originally supposed to happen around the pool and colorful gardens. It all looked great from the porch once our staff helped move the enormous grazing table under cover! In the planning stages Joan envisioned a casual summer party with a southern theme: fried chicken, boneless and served in cones; fresh local corn off the cob spiked with chili and lime; baking powder biscuits and a southern favorite, tomato pie! I searched all our recipe books and online sources for a southern tomato pie and the only common denominator was mayonnaise and lots of cheese. Knowing this was not what she had in mind I baked a test using one of the lighter, cleaner-sounding recipes but it screamed heavy, fat, messy, and much too rich. Yikes! It was now the day before the party and sometimes a deadline is just what the doctor ordered. As a cook for over 35 years I have made my peace with pressure and deadlines so I kicked into gear with what I knew about tomatoes, in this case a bushel of Jersey beefsteaks. Time to invent a recipe for Joan's Tomato Pie that would be light, delicious and all about the tomatoes! I had a Provencal-style tomato tart in mind, but it would have to work in a deep dish pie shell as layers of freshly sliced tomatoes would wind up far too soggy. Start with more tomatoes than you think you'll need as they shrink enormously when cooked. Now peel, seed and roughly chop the tomatoes, this is known as tomatoes concasse, a French term for tomatoes that have been prepared this way. Add a bit of finely diced onion, bay leaves and some fresh rosemary or thyme and slowly cook until the tomatoes give up their liquid and the flavor becomes concentrated. This may take several hours if your tomatoes are ripe and juicy (a small amount of tomato paste can help this process along). Now finely slice more onions and cook in a separate pan until they are slightly caramelized. Finish by stirring in a bit of Dijon mustard and then scatter the onions over a par baked pie shell. Check the cooked tomato mixture, if it still seems too wet for a pie, spoon into a fine mesh colander and drain a bit of liquid out before filling the pie shells. (Reserve that excess liquid for a nice pasta - it's like liquid gold!) Arrange some very thinly sliced tomatoes on top and finish by slicing rounds of fresh goat cheese, seasoned with salt and freshly ground pepper, a few bread crumbs and more fresh herbs. Before baking drizzle a bit of olive oil over everything. Bake for 30 to 40 minutes at 350. I served the pie at room temperature and everyone loved it. Well most of them anyway. There were a few complaints from some of our regular customers. "When are you going to make this for the store?" My response, "OK, look for it soon with one of our summer specials". More than anything, we were just happy that Joan was happy! And now she has a tomato pie named in her honor!